James M. Roberts' primary responsibility is to edit the Rule of Law and Monetary Freedom sections of Index of Economic Freedom. Last Sunday, economic freedom and sound governance took a hit in Ecuador. Lenín Moreno, the nation’s former vice president and socialist candidate, won by a narrow margin amid widespread charges of electoral fraud. The outcome all but secures a fourth consecutive term for outgoing President Rafael Correa’s socialist Alianza Pais party. Ecuadorian law prevented Correa from seeking another term, but constitutional changes he made while in office mean that he would be eligible to succeed Moreno in 2021. The Wall Street Journal reported that last-minute infrastructure spending announced by Correa on schools and hospitals might have been enough to put Moreno over the top. 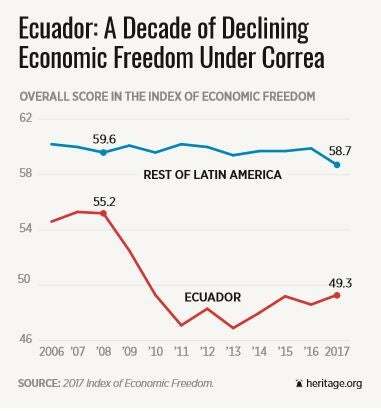 As big a loss as this was for Lasso, the biggest loser is economic freedom in Ecuador. The country’s scores in The Heritage Foundation’s annual Index of Economic Freedom plummeted during the last decade. From a score of 54.6 in 2006, when it ranked 107th out of 157 countries, Ecuador’s score has dropped to 49.3 and landed the country in the index’s lowest category—“Repressed.” It is now ranked 160th out of 180 countries worldwide, and 28th among the 32 countries of Latin America. Others at the bottom of that regional list include Cuba and Bolivia—Bolivia being another member of the socialist, Venezuela-led Alliance for the Peoples of Our America. Socialism, as Hillsdale College President Larry Arnn and others have reminded us, inevitably degenerates into full-blown authoritarian dictatorship—as it now has in the Venezuela ruled by Chavez’s successor, Nicolas Maduro. The Organization of American States has at least taken initial steps to condemn Venezuela, notwithstanding delay tactics deployed by Bolivia’s OAS ambassador. Bolivia’s long-time president and fellow Chavista, Evo Morales, came to power in the same populist wave that Correa rode a decade ago. Just as Correa has apparently been successful in engineering the Moreno victory—thus keeping the seat warm for himself in 2021—Morales has been scheming to stay in power through at least 2025, confirming the fears of critics who allege that Bolivia is also a de facto dictatorship. The sad question now facing defenders of freedom and market-based democracy in Latin America is this: Can Ecuador be far behind?